I'm using 2 column right-aligned labels/left aligned input fields. For 99% of my app, it's great. It follows one of Luke Wroblewski's quickest path to completion patterns. The problem is while trying to follow this pattern, multiline labels get hard to read if the label wraps more than 2 lines. Is it okay to make an exception for these labels in an attempt to have a better user experience? I'm thinking that left-aligned would be better for readability. 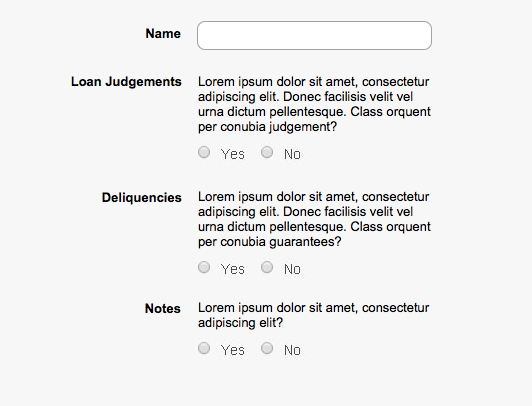 Another option would be to create a pattern where you keep labels in the format of section titles and move any questions that need to be read to to the column with the form elements. I would keep it consistent with the rest of the form. It's not too difficult to read, in my opinion. If it was substantially longer I might look for a different text treatment. My advice: keep it consistent and right aligned. Not the answer you're looking for? Browse other questions tagged forms labels or ask your own question. How do you indicate progress to users in a multi-step form?